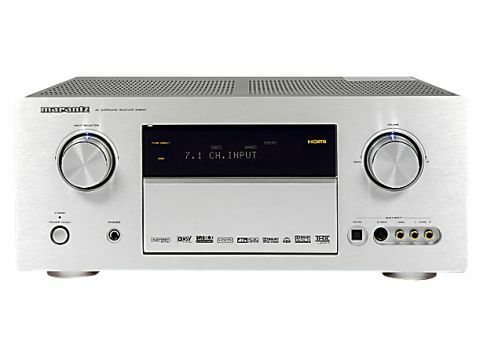 I haven't been too proud to beg in the past and at long last Marantz has thrown me a metaphorical penny - the SR8001. My prayers have been answered with a receiver offering two HDMI outputs. Well, almost. While Marantz's THX Select2-specified beasty does indeed boast two fully 1080p-compatible outputs, they cannot output simultaneously. Not really a major issue in my one-room setup, but a right pain if you want to run HDMI multiroom, as you have to set the HDMI output from one display to output to the other. Head - table - thump. Still, this is at least a step in the right direction and, to be fair, my two-input and four-simultaneous output HDMI multiplexer cost nearly £400, which suggests that generating multiple outputs from a single HDMI source is still expensive. Moreover, one can't knock the SR8001 for its de-interlacing, analogue video conversion to HDMI, and more traditional multiroom features such as multiple component video outputs and IR repeaters. But that is all just icing when you consider what the SR8001 is all about - 125W to all seven channels with a THX badge to underpin those credentials. In reality, THX brings re-equalisation to tame bright soundtracks mastered for a large cinema, plus timbre-matching filters to compensate for small rear speakers and something called adaptive decorrelation. The blurb says this alters time and phase to expand the listening experience but I generally find a bottle of Rioja and a bag of Butterkist does that just as well. If an amp was ever to sound like it looked, the SR8001 is it. Big, muscular, bold and well-controlled, this receiver simply laps up epic-scale movies with a well-oiled mix of power and precision. Bass is absolutely subterranean, driving big floor-standing speakers and a subwoofer with equal aplomb for the full flare-flapping low-frequency effect. Stick on the beginning of Leon ( The Professional if you have the R1 disc) and the heartbeat before the opening shoot-out is beautifully intense and oppressive, getting your heart beating in rhythmic, terrifying synchronicity. The sound has Marantz's rich hi-fi heritage written all over it. There's a smooth balance throughout the bass and midrange and a mellow top-end that never gets acidic or shouty. It's extremely solid across the range and, while others at this price might offer a little more air and space to the soundstage, few do high-volume mayhem with quite such grace and solidity. Better still, for those with understanding neighbours, it goes very loud. The lush balance and slightly restrained top-end beg liberal use of the volume control and generate peak SPLs that threaten to do structural damage. Back down at Planet Sensible, when the wife's patience at kitchen utensils falling of the shelves finally runs out, the SR8001 feels a bit like a Ferrari in the wrong gear. The sound is mellifluous almost to a fault and at day-to-day listening levels it's a bit shut-in and restrained. There is a distinct shortage of dynamic range below about -15dB on the volume control, with a steady increase in chutzpah until it gets into full flow around -10dB and higher. What happens above this depends on the quality and size of your speakers - namely whether they rock the house or jettison their cones in disgust and retire to the great speaker dustbin in the sky. Ahhhh, I've put a few there. Of course, the SR8001 comes with a RoomEQ system, and in this instance it is the full Audyssey MultEQ experience with a Marantz-tuned flavour. The setup of MultEQ is arduous, and, if you opt for the full gamut of measurement from six listening positions to glean the most accurate acoustic data, you can write off at least half an hour of messing about and strange noises. Once set, the options are standard 'Audyssey', which aims to give the best all-round surround sound; 'Front', which balances the sound from all speakers to match the front pair; and 'Flat', which attempts to generate a flat frequency response from all speakers at the listening position. The effect of all these filtering and processing shenanigans will be dramatically different depending on your room, but in my setup the change was radical, revolutionary even. You can check the filter settings and, aside from a few midrange anomalies, the EQ system rolled off the low-frequency output of most channels and boosted the highs. Not surprisingly, set to standard 'Audyssey' mode, the SR8001 goes from laid back to positively hyperactive with sparkling effects; with Harry Potter and The Goblet of Fire, I noticed a more spacious and open soundstage, with crisp and intense dialogue. The 'Audyssey' setting also proves a tonic for the SR8001's weak low- volume performance, creating a much brighter and bigger sound. The trade off comes as the volume increases. Bass that wobbles your gizzards and is richer than a dark-roast coffee advert is conspicuous by its absence, and past about -10dB on the dial sibilance begins to taint dialogue. Switching to the 'Flat' mode was hilarious - it expanded the Audyssey's top-end boost and LF roll off to the tune of 9dB at 16kHz and -7dB at 63Hz across most channels. Bright, sibilant and harsh, with next to no bass. Home cinema? Nah. The SR8001 is going to court some tastes and miff others with its diametric twin characters - one either side of the EQ systems switch. This is a definite try-before-you-buy receiver as it will be at its best with some speakers more than others. For me, surrounded by a tower of huge floor-standers, two HD displays, a subwoofer the size of a shed and a field full of sheep as neighbours, the SR8001 is in its element. Stick on Casino Royale or an Epica CD, whack up the volume and everything is all right with the world.